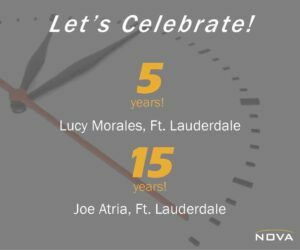 Anniversaries for Joe Atria and Lucy Morales! We’d like to recognize a few people in our Ft. Lauderdale office. Lucy Morales has been with our firm for 5 years, and Joe Atria has reached 15 years! Happy NOVA anniversary to you both!